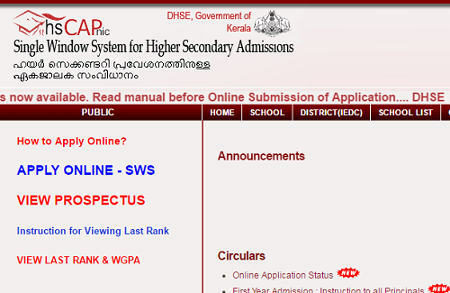 Kerala Plus one admission 2019-20 online submission of applications in merit quota (HSCAP Single Window System) will be started on May 2nd week, 2019 at www.hscap.kerala.gov.in. Kerala Higher Secondary First year admission in Govt and aided Higher secondary schools in Kerala is done through a Single Window Admission system (SWS – Ekajalakam). Last year hscap plus one single window admission process starts on May. This year also the online admission process stats on May. Candidates who want to take plus one admission can apply online thorough the site www.hscap.kerala.gov.in. Plus One admission procedures and instructions are available at HSCAP site. Candidates must read the online registration instructions before filing the application. Kerala higher secondary plus one admission for the academic year 2019-20 online registration will be done through a single window admission portal www.hscap.kerala.gov.in. The candidates who have passed SSLC (Kerala Syllabus), CBSE, ICSE, THSLC or equivalent examination can apply for HSE Plus one 2019 admission in Kerala. Go to the site www.hscap.kerala.gov.in. Keep the registration number for admission process. The candidate submit the print out application form with the signature of the candidate and guardian along with the self attested copies of supporting documents and application fee to the principal of a related HSS School or aided higher secondary school in Kerala on or before the specified date.